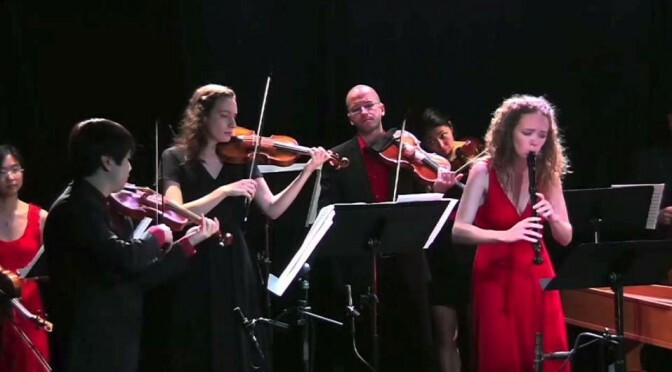 Unconducted orchestra of young players of baroque instruments in New York City, the New York Baroque Incorporated perform Antonio Vivaldi’s “La Follia”, the 12th of Antonio Vivaldi’s Twelve Trio Sonatas, Op. 1. Sonata No. 12 in D minor, RV 63. Vivaldi’s Concerto for violin, strings and figured bass in E minor, “Il favorito,” RV 277; performed by New York Baroque Incorporated & Monica Huggett. Recorded on 23 March 2013 at The DiMenna Center for Classical Music.